The situation on the Space Station is comparable these days: Three of the astronauts on the International Space Station have had their return to Earth delayed so we unexpectedly had additional crew time for them. This does not mean that Samantha and company were finally able to fully enjoy the great view of the Earth, because here at the control centre we have a long wish list of things that we want done. We recently moved to Node 3 the Permanent Multipurpose Module (PMM), which was designed as a transport container for the Space Shuttle and left attached to Node 2 after the end of the Shuttle era. This move offers extra storage space so that Node 2 has an extra docking port for future visiting vehicles. We also finally exchanged the old-style video tape recorder in Columbus for a modern hard disk recorder. Samantha faced exchanging a water valve, which had not been functioning as expected for some time now on Friday: we put the extensive activities on her timeline and it kept her busy. 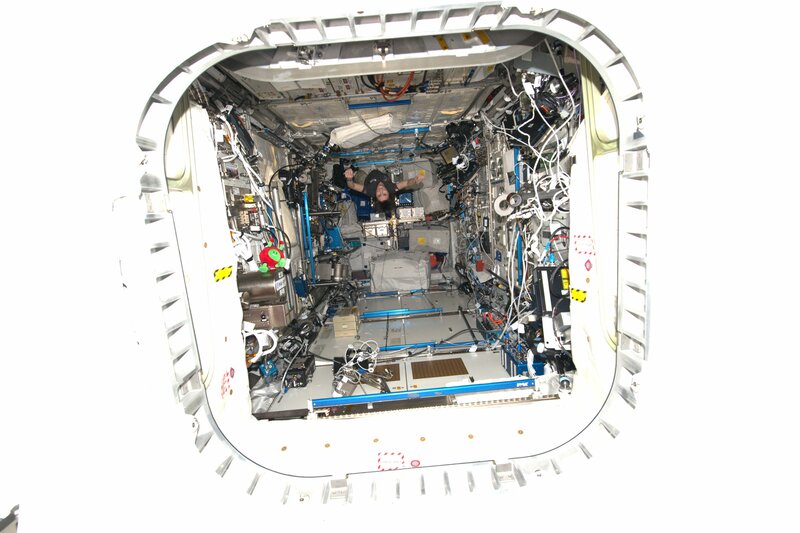 Samantha had to start work the day before by reconfiguring the Columbus module as the water valve is hidden behind panels next to the hatch and blocked by an experiment rack. 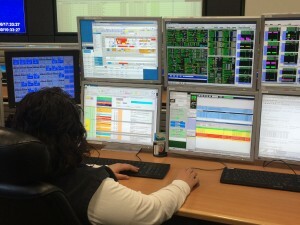 So Samantha first had prepare the “Express rack 3” to tilt it away to enable access to the valve. Many cables and pipes had to be removed for power, nitrogen, as well as the venting and vacuum lines, video connections and data lines. 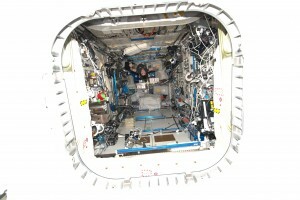 On Friday, Samantha had to tilt the rack forward into the cabin, which was easy to do in weightlessness. She now had access to the area where the water valves are in Columbus and could remove the Nomex cover. We were now looking into Columbus’s innards. Columbus needs to be actively cooled as some hardware produces heat which is removed by water. 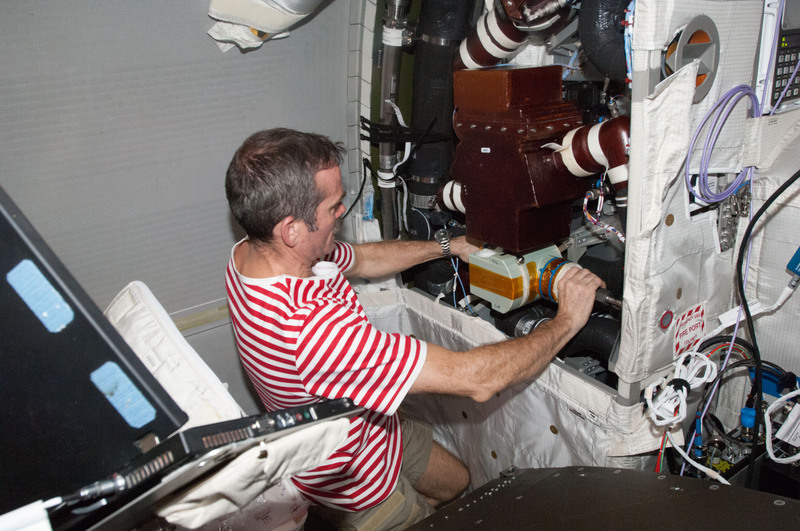 In addition the air of the module must be cooled: air conditioning in space! Lastly humidity is an issue, astronauts sweat like everyone else and the water in the air must be kept within limits. Condensation would be a serious problem, especially in areas where electrical current is present. Therefore we use our cooling-water system to force condensation in a special device that cools the air and dehumidifies it before sending the collected water to the American recycling system. Columbus has two water pumps to do all this and various mechanisms to adjust the temperature of the water coupled with two heat exchangers that transfer absorbed heat to the outer ammonia cooling circuit, from where the heat is radiated into space. Of course that requires a lot of valves, for water shutoff, mixing or bypassing, and today Samantha was looking to replace the cleverly-named “Water-On-Off Valve 6” which we call WOOV6. Naturally the Columbus Control Centre made sure no more water flowed through that valve – in addition we allowed it to warm slightly: we didn’t want to ask the Italian astronaut to put on winter gloves for this operation. With the Express Rack 3 tilted, normal air circulation was disrupted – meaning the smoke detectors could not monitor all areas of the module and the astronauts had to be “prime for smoke detection”. In between there was a brief but hectic moment when Sam informed us that one of the quick-release fasteners was leaking. Water floating about the cabin is always something that we do not appreciate at all. We quickly got the situation under control though and she mopped up the spilled water. I am impressed Samantha did it all with parts on hand. No hardware store! Quite the odd read, however still very fascinating to see how Plumbing is when it comes to space. This is amazing! Anything with space travel always catches my eye. Great work, Samantha!